2 flute, carbide tipped with totally enclosed ball bearing guides. For decorative edges on moldings, signs, plaques, furniture, etc. Lowering the depth of cut will produce a decorative bead. 1/2" shank. 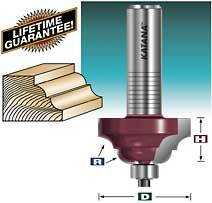 Also called "Double Roman Ogee" bit. For European "cup" style hinges. 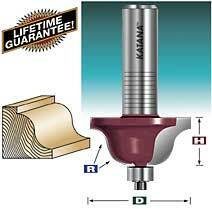 2 flute, carbide tipped bits are specially designed to shape the edges of doors that use European cup style hinges. Normal door edge and edge profile bits cut too deeply into the door edge and interfere with the hinge cups. Shape the edge with a shallow detail on any cabinet door.